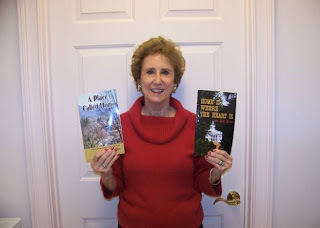 I recently met Ann Melton author of A Place Called Home. Her second book, Home is where the Heart Is is a sequel to the first. Ann Davis Melton grew up in the small Southern town of Sylva and went on to earn her undergraduate degree from Western Carolina University and her doctorate from the University of South Carolina. She worked as a language arts consultant for the Western Regional Education Center before becoming Superintendent of Madison County Schools. She is now retired and lives in Waynesville with her husband, Frank. This excerpt from A Place Called Home will give you an idea of her writing as she tells stories about life in the quiet and safe village of Sylva where she grew up in the 40's, 50's and 60's..
Across town things weren’t nearly as quiet at the Will Sherrill house. Will was a lawyer and a tough one at that, and he ran his household the way he ran his law practice. Of late, however, things seemed to have gotten out of hand. The active social life of his older children was interfering with his rest, and they seemed to be coming home later and later at tonight. The week before he had called a family meeting and announced that the doors would be locked at exactly 11:00 P.M. There would be no more of this late night foolishness. However, things had not worked out exactly as he had planned. He had gone to Glenville to meet with a client and had found the new client’s run of corn liquor greatly to his liking. He and the client had sat around after the meeting and enjoyed too many drinks, and time had slipped away. At 11:30 P.M., though he knocked and knocked, no one answered his own front door. He carried no key – they had never locked the doors before. He went around to the back and even to the side doors to no avail. As a last resort, he began yelling loudly, so loudly, in fact, that even the neighbors heard him. Finally, a light came on in a distant part of the house, and the slight figure of his wife approached the door. However, instead of unlocking the door, she quietly said, “Will, last week you laid down the law and said that the doors were to be locked at eleven o’clock and that no one – no one would be allowed in after that. It is now eleven-thirty, Will. I’m afraid you will just have to sleep in the barn tonight,” and with that, she returned to bed. He couldn’t believe it! Of course, he was always surprised by Mary’s strong side; he had to admit that. He just hated that he had been beaten by his own game. His wife such a quiet, peace-loving individual – so unlike him, and everyone in town loved her. It was to Mary that folks came if they needed to talk, for she was a wonderful listener, and all admired her wisdom. She always had a fire in the wood-burning cook stove in the kitchen, and a kettle of water always sat on top, ready to offer a cup of tea, and there were always good things to eat in the warming closet above the stove. In fact, Will could just taste some of those goodies right now. I might just be able to sleep if I had a warm glass of milk and a couple of her sugar cookies right now, he thought to himself. It proved to be a long night for Will. He slept in his clothes of course, and was lucky enough to find two horse blankets for cover and fresh hay to lie on, but he had a difficult time falling asleep. He could not get comfortable no matter which way he lay. He also had a great deal on his mind. The next day he would have to present his closing arguments in a case that had proven to be long and ugly, and he needed to be at his best. A group wished to build a dam at Glenviile, and he was representing the environmentalists who did not want to see the beautiful stream dammed. He tossed and turned all night planning his closing remarks. “Gall durn it!” It was cold and he was uncomfortable. “How could he think in these conditions?” He also needed to relieve himself of several glasses of the homebrew he had consumed, but he hated to get out from under the warm covers – and that is when his closing statements formed in his mind. The next day dawned clear and bright, and when Will got to the house, he found his breakfast on the table and everyone acting as though nothing unusual had happened. Except for an occasional look one child would give another or a slight upturned mouth, the meal went as usual. As soon as breakfast was over, he bathed, dressed, and left for the courthouse with his briefcase in hand. He arrived in the courtroom about nine o’clock and found several people milling about. By nine –thirty the courtroom was full. The judge appeared soon after, and by eleven-thirty all witnesses had been called, and it was time for closing arguments. He knew he was not going to win the case. The community needed the power plant too badly, and this was really the best place to build a dam. What the hell, he thought, as he rose to approach the jury. He might as well enjoy the moment. Looking into the eyes of each man and woman in the jury box, he spoke of the pristine beauty of the mountains and the stream that would be ruined if this dam was built. He spoke of the wildlife that abounded and the detriment to them, and he spent a great deal of time convincing the jury that the dam and power plant would not be everything they had hoped it would be. When he felt he had the jury just where he wanted them, he delivered his closing remark. Letting his voice rise so that it could be heard by one and all he said, “And now, ladies and gentlemen of the jury, I wish to inform you that there is more water power below my belt than there will ever be in Glenville Dam,” and with that he turned and sat down. The silence in the courtroom was long. He could hear his heart beating, and he could feel the laughter rising up in him until he felt he might burst. Finally, the judge got his wits about him, gave the charge to the jury, and they filed out. Grabbing his papers, Will Sherrill made a dash for the door. Will Sherrill was Ann's grandfather and an important character in the book. Ann's books can be found at City Lights Books in Sylva.